In July my husband and I stayed overnight in a luxurious bed and breakfast in Durham, NC. It is too bad we were there for only one night. It really is a place to go to spend a few relaxing days. After breakfast we walked around the gardens before heading on our way. I was reminded of our honeymoon. We drove up to Nova Scotia and stayed in bed and breakfasts and country inns. I found that to be a delightful experience. Since that time, which was 27 years ago, Bob and I often discussed owning a b&b in the country some day. Back home from the trip and tending to our gardens, I began thinking about how I could make that dream a reality today. No, it isn't practical to turn our tiny house into a b&b, but what could I do to invite people to enjoy the peace and beauty that I experience while spending time in my gardens? I was also reading a book called An Altar in the World by Barbara Brown Taylor at this time. I found it extremely inspirational and life changing. 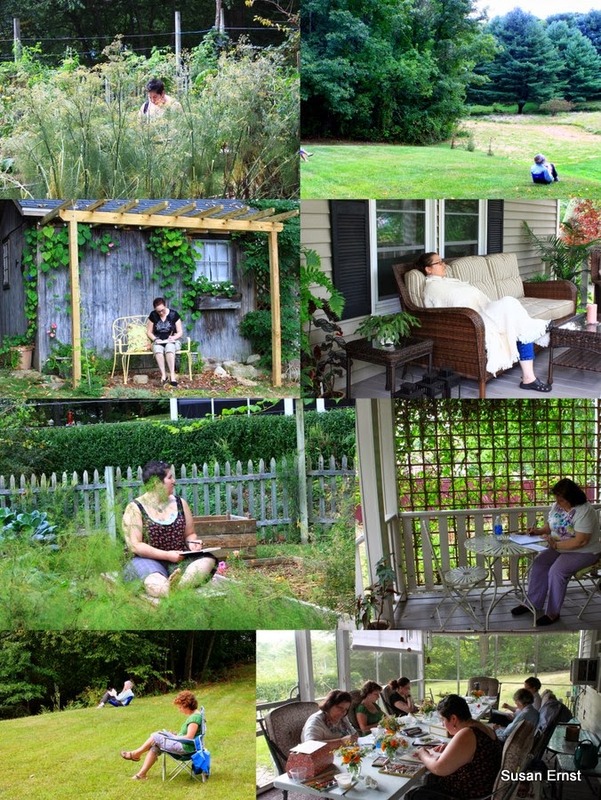 Chapter Two, entitled The Practice of Paying Attention is what helped me to formulate the retreat. (The seeds of which had already been planted last year while reading The Artist's Rule by Christine Valters Paintner, which is along a similar vein.) I realized that I didn't need a fancy house and immaculate gardens in order to help others see and hear what I do when I am outside. If I love it, won't others as well? I took the chance and offered this one day retreat. Yesterday, six wonderful women enjoyed their time here. They got to relax, reflect and spend some needed alone time. We did end the day with sharing. It was moving to hear what these women were able to experience from the assignments they were given and the time they spent alone in nature. 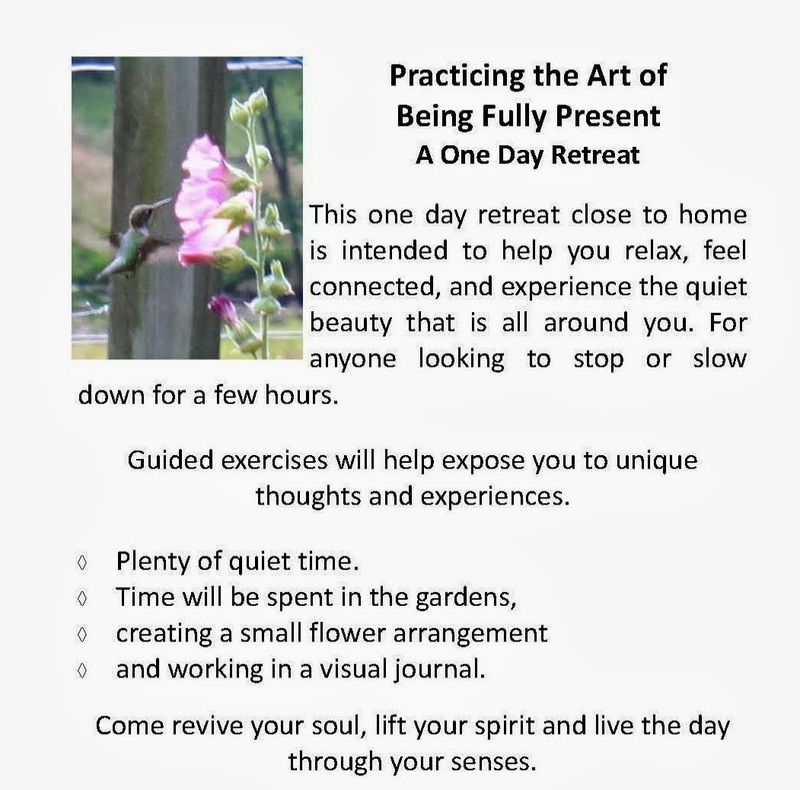 I plan to hold this retreat on a monthly basis from May through September. The women encouraged me to add other themed retreats as they would like to participate again. Follow this link to view some of their comments here. Hawthorn, May Blossom or May Tree is a member of the Rose family and contains over one thousand species found in England, Europe, Asia and North America. A small tree, it grows 20-30 ( 10 m) feet tall and wide. Small white flowers borne in clusters (properly termed corymbs) are said to smell foul until pollinated by the flies that are attracted to them. Once the flower is fertilized, the scent becomes a pleasant one. The tree flowers in May; hence it’s alternate common names. Deep green lobed leaves in spring and summer turn beautiful shades of scarlet and orange in autumn. Haws, as the fruit is called, ripen in September and October. The fruit is similar in appearance to the hips of wild roses. Haws are a favorite food of birds and small animals and have been used by humans. The ripe fruit is gathered and used to make a preserve (with lemons and sugar) or cooked with other fruits to make jellies, as they are rich in pectin. This plant has been used to treat arthritis and rheumatism as well as emotional stress, nervous and heart conditions. Native Americans dried the berries, then ground them into meal and mixed with wheat or corn flour for baking. They also turned the bark fibers into cordage and used the thorns as awls. Another name for this tree was Fairy Thorn. Named by the ancient Bretons, they believed that the tree was haunted by fairies. English Hawthorn, Crataegus monogyna or C. oxycantha, was planted extensively as a hedgerow plant because of its quick growth and long thorns. The word “hedge” is in fact derived from the Anglo-Saxon word for hawthorn – Haegthorn. According to one author, Frank Tozer, ancient hedgerows are becoming a thing of the past in England. He writes, “In densely populated Britain, Hawthorn hedges were very important to wildlife, as a source of both food and habitat. Indeed much of the wildlife in that country has disappeared in the past forty years, as hedgerows have been torn out to enlarge farm fields for mechanized farming. Another negative effect of their removal has been vastly increased soil erosion.” Hawthorns spread by suckers which can be a nuisance if planted in a small area, but does help to keep soil in place. 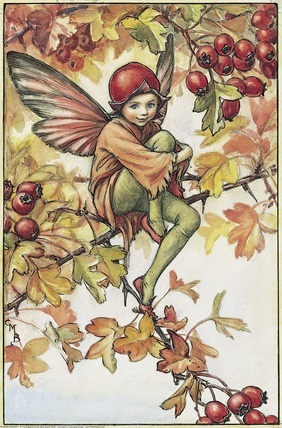 There are several hawthorn species native to the United States. These are usually found growing along the edges of forests or meadows. Presidents George Washington and Thomas Jefferson planted Crataegus phaenopyrum on their estates. Article written by Susan Ernst for 12 Months in View.